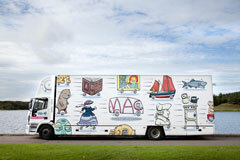 The current exhibition on board MAC (Fife’s mobile arts coach), Kingdom of If, was organised last year by FCA&C. It has since been touring Fife schools and community venues and will be making a special visit to St Andrews on Tuesday 27 August as part of the Imagining Natural Scotland conference. During its visit to St Andrews, MAC will also be open for visits by the general public.MAC will be parked in the carpark beside St Andrews University’s Gateway Building (North Haugh) on the outskirts of the town between about 10am and 3.30pm. Call in for a look at artworks created by artists on the theme of sustainability.